It's incredible that after 30 centuries the largest stadium in the world is still Circus Maximum. Could contain up to 350.000 people and the entrance was free, offered by the state were the famous chariot races, gladiatorial shows, and also of wild beasts. 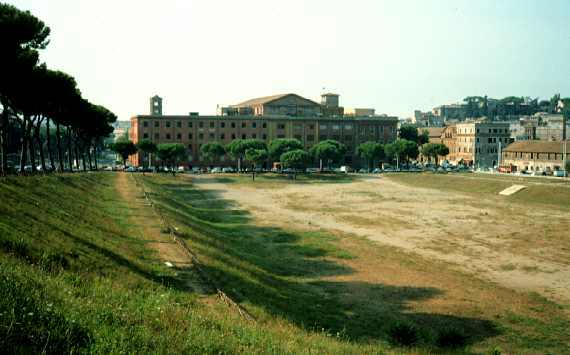 It is said that the 'Circus Maximus' was already present in that area since the beginning of Rome, in 800 BC , but it was the Emperor Trajan, who rebuilt it as we see it now. Unfortunately, it is now only one archaeological find, is in fact the center of the city of Rome, is sometimes used to make the great concerts of Italian rock stars such as Eros Ramazzotti. And 'which derives precisely from the Circus Maximus to build fashion cities of the Roman Empire of the stadiums - later also as the Colosseum in Rome - where you can make these shows which increased the pomp and respect that the people had for the Roman emperors. After almost 30 centuries is amazing to know that Circus Maximus is the largest stadium in the world with its 621 m (2.037 ft) in length and 118 m (387 ft) in width; a really masterpiece of Roman architecture.